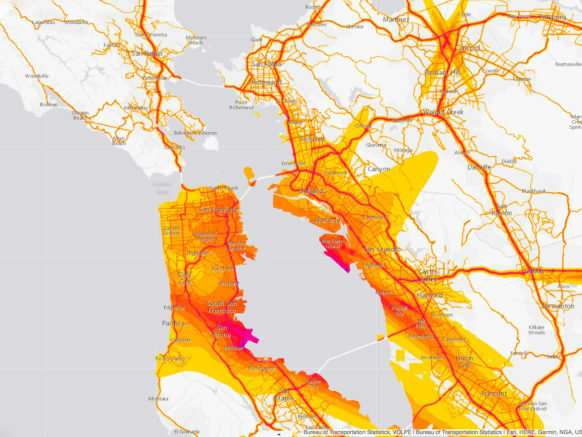 The recently released national noise map makes it strikingly clear just how much air travel contributes to the noise pollution in our lives. In my previous discussion of flying cars I expressed the feeling that the noise of flying cars is one of their greatest challenges. While we would all love a flying car (really a VTOL helicopter) that takes off from our back yards, we will not tolerate our neighbour having one if there is regular buzzing and distraction overhead and in the next yard. Helicopters are also not energy efficient, so real efforts for flying cars are fixed wing, using electric multirotors to provide vertical take-off but converting in some way to fixed wing flight, usually powered by those same motors in a different orientation. If batteries continue their path of getting cheaper, and more importantly lighter, this is possible. Fixed wing planes can be decently efficient -- particularly when they travel as the crow flies -- though they can have trouble competing with lightweight electric ground vehicles. Almost all aircraft today fly much faster than their optimum efficiency speed. There are a lot of reasons for this. One is the fact that maintenance is charged by the hour, not the mile. Another is that planes need powerful engines to take off, and people are in a hurry and want to use that powerful engine to fly fast once they get up there. It is the silent flight that is interesting. An autonomous high efficiency aircraft, equipped with redundant electric motors and power systems, need not run its engines a lot of the time. While you would never want to be constantly starting and stopping piston powered aircraft engines, electric engines can start and stop and change speed very quickly. The motors provide tremendous torque for fast response times. It would be insane to regularly land your piston powered aircraft without power, figuring you can just turn on the engine "if you need it." It might not be that crazy to do it in an electric aircraft when you can get the engine up and operating in a fraction of a second with high reliability, and you have multiple systems, so even the rare failures can be tolerated. Both passengers and people on the ground would greatly appreciate planes that were silent most of the time, including when landing at short airstrips. It could make the difference for acceptance. For a more radical idea, consider my more futuristic proposal of airports that grab and stop planes with robotic platforms on cables. Such a system would even allow for mostly silent takeoff in electric aircraft. Making efficient aircraft VTOL is a challenge. They tend to have large wingspans and are not so suitable for backyards, even if they can hover. But the option for redundant multirotor systems makes possible something else -- aircraft wings that unfold in the air. There are "flying cars" with folding wings which fold the wings up so the car can get on the road, but unfolding in the air is one of those things that is insane for today's aircraft designs. A VTOL multirotor could rise up, unfold its wings, and if they don't unfold properly, it can descend (noisily) on the VTOL system, either to where it took off form, or a nearby large area if the wings unfolded but not perfectly. An in-flight failure of the folding system could again be saved (uncomfortably but safely) by the VTOL system. We don't yet know how to make powered vertical takeoff or landing quiet enough. We might make the rest of flight fairly silent, and make the noisy part fairly brief. The neighbours don't all run their leaf blower several times per day. But a combination of robocars that take you on the first and last kilometer to places where aircraft can make noise without annoyance if they do it briefly might be a practical alternative. Planes that fly silently would not fit well with today's air traffic control regiments that allocate ranges of altitude to planes. A plane with a 50:1 ratio could travel 10 miles while losing 1,000 feet of altitude, then climb back up on power for another silent pass. But constant changing of altitude would freak out ATC. A computerized ATC for autonomous planes could enable entirely different regimens of keeping planes apart that would allow this, and it would also allow long slow glides all the way to the runway. Though your point re starting and settling electric motors is still valid, keep in mind that a big contributor to the drag that a piston aircraft experiences when the engine is not firing is the propeller. It Windmills, and so the engine will start quite quickly if all three requirements are restored (fuel, air, and spark). Also, altitude assignments as you describe are only made over 18000 feet. Which is far above where these would / could fly. Correct, they would not fly that high. But a world of "flying cars" needs a vastly larger and different ATC system, including some means of avoidance. Of course, primarily that will be sensor based, but I suspect that "lanes" (with assigned flight paths and altitudes) will exist to make the user of sensors or avoid a rare thing, other than vehicles you know to be ahead or behind you in your "lane."